January 12, 2016 | ProgressTH When we see a rice field we may take for granted the amazing journey the water that drives it takes to arrive there. While some fields fill up with the rains and are supplemented with well water or local ponds, the most productive fields are generally fed by national irrigation networks. 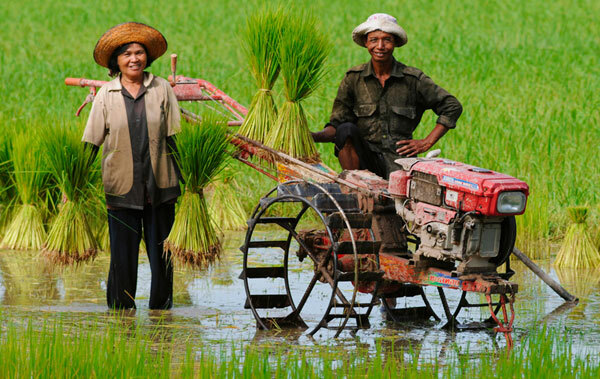 We take for granted idyllic scenes of rice farmers tending their crops. Where does the water come from that fills their fields? Few know much about the size, complexity, and impact these networks have, but the truth is, the journey this water takes to arrive in a rice field is truly amazing. Flatter plains where most rice farming takes place, are generally fed by irrigation water that originates high in distant mountains. In central Phetcaburi province, Thailand, farms are fed by several reservoirs located among western mountains both in the province and well beyond it. Rain storms in the mountain... the first step on a long journey to irrigate farmlands hundreds of kilometers way. 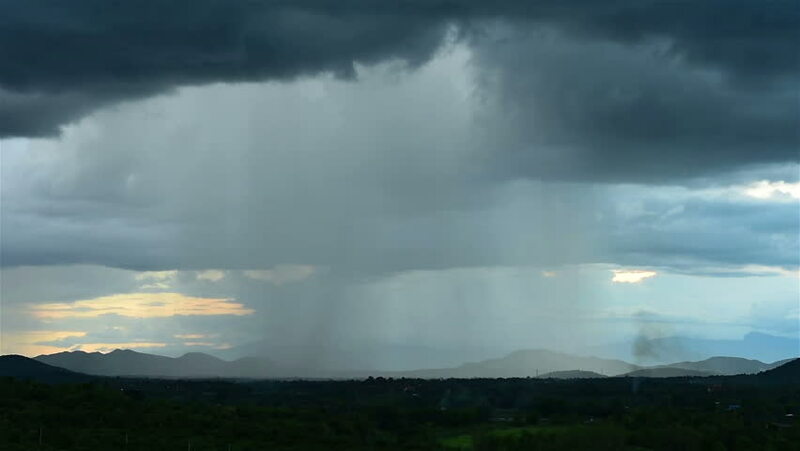 We begin with rainstorms in the mountains of Kanchanaburi province, over 200 kilometers away. 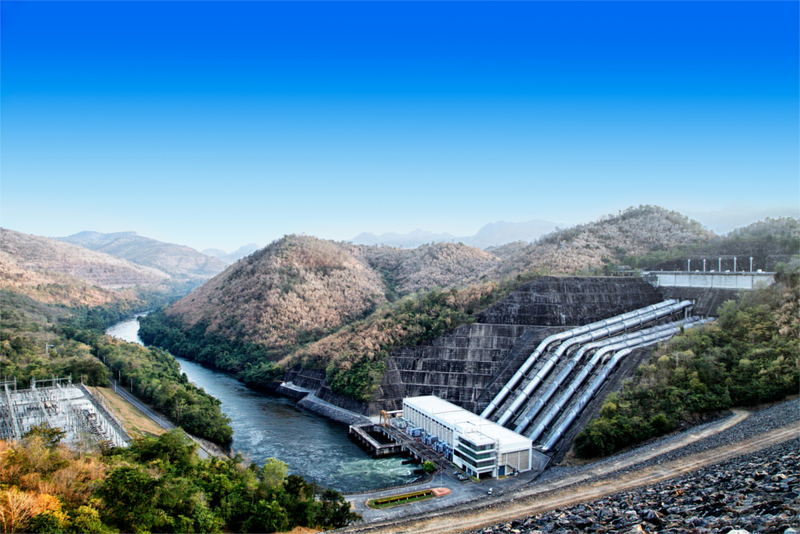 Rains feed into a network of streams, tributaries, and rivers that eventually swell behind the impressive Srinakarin Dam. It stands over 140 meters (460 ft) tall and stretches across some 610 meters (2,000 ft). Srinakarin Dam, Kanchanaburi province, Thailand. Rains in the mountains feed into the reservoir before going on to supply thousands of farms irrigation water across several provinces. It then finally empties out into the Gulf of Thailand. 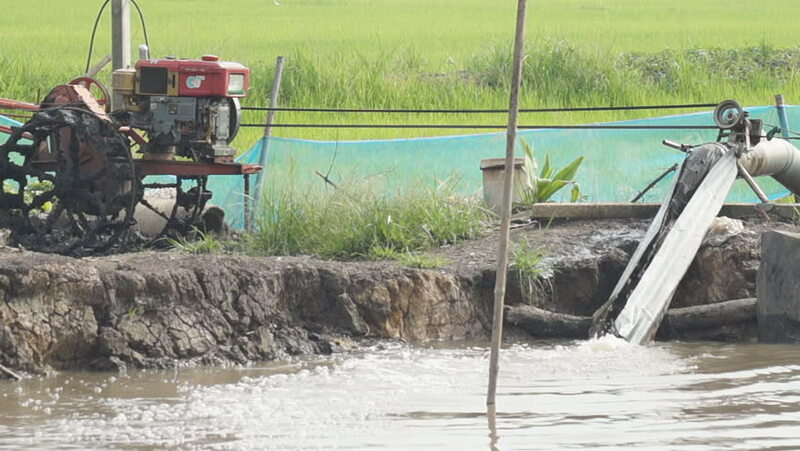 Not only does it feature a 720 MW capacity hydroelectric power plant, it is also the starting point of a massive irrigation network that feeds farmland in at least three provinces until the water it manages finally reaches the Gulf of Thailand. From Srinakarin Dam, the water works its way down a winding river traveling southeast. It passes under the famous River Kwai Bridge, constructed during WW2 by the Japanese, and still provides passage for trains running along Thailand's state railway system. Water from another massive reservoir held back by the nearby Vajiralongkorn Dam meets with this river near Kanchanaburi City. This river continues all the way to the Gulf of Thailand, but along the way, smaller canals lead off from it, stretching far and wide, and bringing much needed irrigation water to thousands of farms. Water from the Srinakarin Dam flows under the famous "Bridge over the River Kwai" in Kanchanaburi province, Thailand, headed on its way to canals, sub-canals, and finally rice farmers' fields. One of these canals stretches southward, into the heart of Phetchaburi province, before joining water from Kaeng Krachan Dam and other, smaller reservoirs. Eventually the water passes through Phetchaburi City via Phetchaburi River before emptying out in the Gulf of Thailand as well. 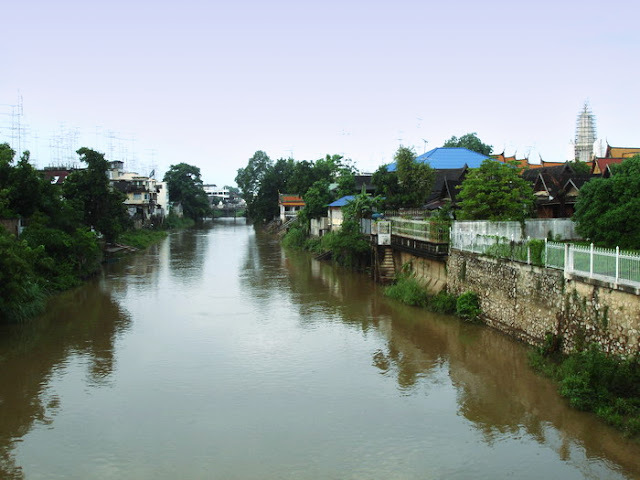 Phetchaburi River flows through the heart of the provincial capital. 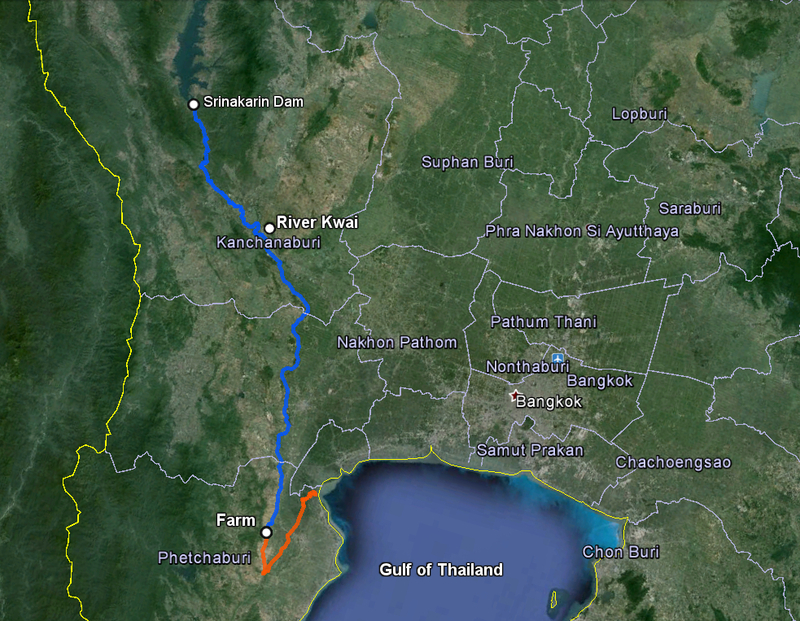 The water originated both in mountains in the west of the province, and also 2 provinces away in Kanchanaburi. All along the way, it feeds smaller canal networks throughout villages along its path. These smaller networks of canals consist of cement works no more than a meter across and perhaps a meter or less deep. Farmers must use water pumps to feed water from both the main canal into these smaller systems, and from there, into their rice fields. Local canals range from somewhat large, to smaller canals not even a meter wide/deep. 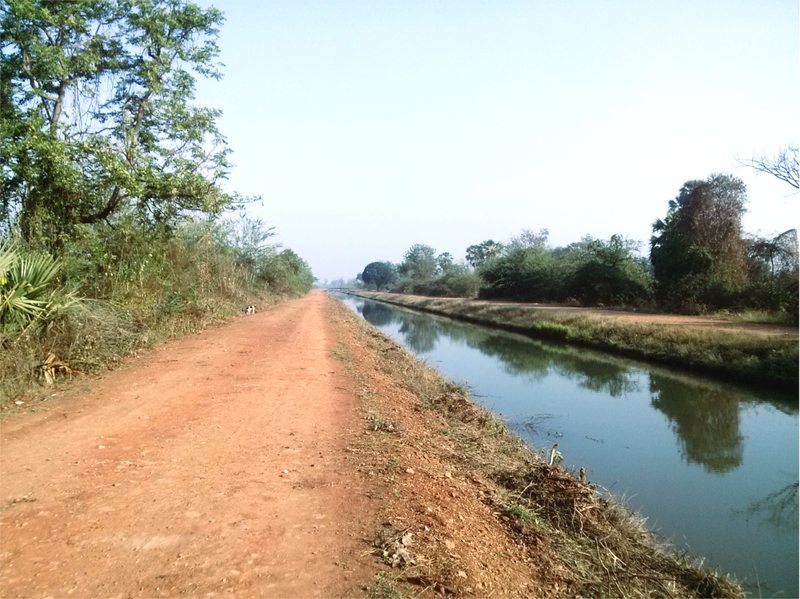 Rice fields that do not have direct access to canals must take water from adjacent fields that are next to these canal networks. It is a process that becomes routine season-to-season. Pumping is done with gas powered push-tractors temporarily hooked up to mobile pumps which includes a long metal shaft and a large, flexible plastic hose so that the entire system can both move water over levies, and move from one field to the other until all fields are flooded adequately. Flooding a field can take a couple of hours, and for a small to moderate sized farm with several fields, it can take up to an entire day to flood them all. A push tractor (left) and a water pump (right) help pump water over levies to fill rice fields, thus ending the amazing journey this water took through irrigation systems to help farmers raise their crops..
From mountain rains, to winding rivers, to networks of canals, and arriving finally at tractor-driven water pumps, water in central Phetchaburi province travels some 200 to 300 kilometers before finally settling in a field. But because of this massive, established infrastructure, if reservoir levels are optimal, two growing seasons can take place per year, giving farmers who have access to this amazing system a significant advantage over those who don't. This map shows the path of irrigation water from the Srinakarin Dam to a farm over 200 kilometers away, before exiting into the Gulf of Thailand. Water management is an essential part of farming and without it, results can be disastrous. Areas without access to well-developed irrigation infrastructure like described above, must generally rely on groundwater and wells, as well as deep ponds dug for saving rainwater between rainy seasons. In the future, solar power and more efficient atmospheric water generators may help fill large underground reservoirs between or even under rice fields, ensuring that the hotter the days, the more water that can be generated. In the foreground, we see a gas-powered generator. 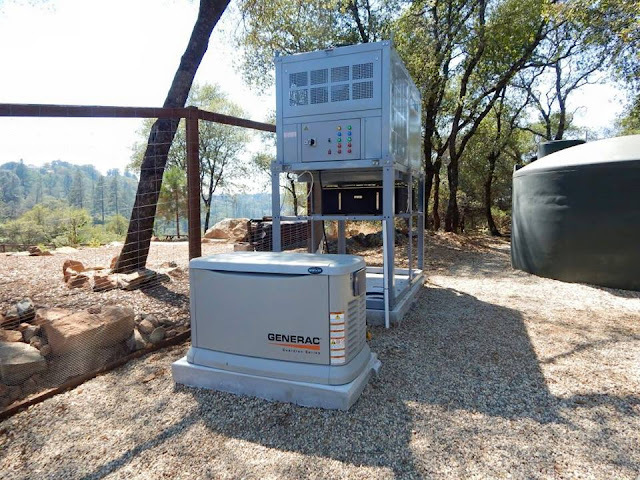 Just behind it is an atmospheric water generator (a AquaBoy 300 producing 1,200 L a day) which in turn, fills the large reservoir in the background (right-hand side). Improved versions, and those possibly using solar power could one day help localize water management for farms big and small. This is only the story of one particular region of one particular country. Where does your water come from? And where does the food you eat get the water it needs before coming from fields afar to your dinner table? What would happen if this was disrupted by weather, economic factors, or a disaster? The answers to these questions may be more interesting (and important) than you thought and are surely worth asking. Solutions to potential problems may also be worth pondering before they happen.